Richard Christy – SNMS Presents: Movie Lovers	Cmon out to Monster Mania 2017!!! I saw this come up in my podcasts on ITunes and I almost screamed while in the office! Yes yes YES! This is one of my favorite movies! I’m doing something out of the ordinary and writing this before I listen to the episode, that’s how excited I am. I absolutely loved Wayne’s World on SNL when I was a kid. It was the reason I stayed up so late on Saturdays. When I found out there was a moving coming out I literally begged my parents to take me to see it. For weeks and weeks I bugged them, trying everything I could to get them to take me. Finally, one Monday night, my dad took me after we all had dinner. This might have been the night of that year’s Oscars, I’m not sure. But when the movie started I was so excited. To my surprise we both loved it. My dad was cracking up almost as much as I was. And even better, I got it on VHS the following Christmas. I also have a fondness for this movie because of my best friend in Elementary School named Matthew. He and I would pretend to be Wayne and Garth (I was Wayne, he was Garth…though in hindsight maybe we should have reversed) It was something we loved. Sadly, Matthew is no longer with us, but when I see the movie, I think of him. And like I said on the comments for the last episode, I got to see this at the Nitehawk in Brooklyn a couple of years ago with my sisters. Kurt Fuller was there and they brought him up to talk about the movie a little bit. When he appeared in the movie the audience cheered extra loud. So glad you guys are doing this episode. As you can see, it’s brought up a lot of fond memories. Can’t wait to listen to the episode itself. I’ll have more to say then. Thank you as always for being the bright spots on tough Fridays at work! Hey Jose, thank you so much for dropping us a line, even before you give it a listen, ha! Great memories, and we’re so sorry about your friend, but it is nice than to have these kind of films that let you remember fonder memories, of those glorious, exciting days of being a kid. How we miss all that. Hope you like this installment and it lives up to your podcasting standards. And, we’re always glad to alleviate some of that Friday boredom. Thanks again. And as always, you the man. So I got to listen to the episode and I LOVED it! It’s also great that you guys both appreciate Dana Carvey and all the little things he did in the movie. A couple of recommendations I’d love to make for both Mike Meyers and Dana Carvey would So I Married an Axe Murderer and Clean Slate. 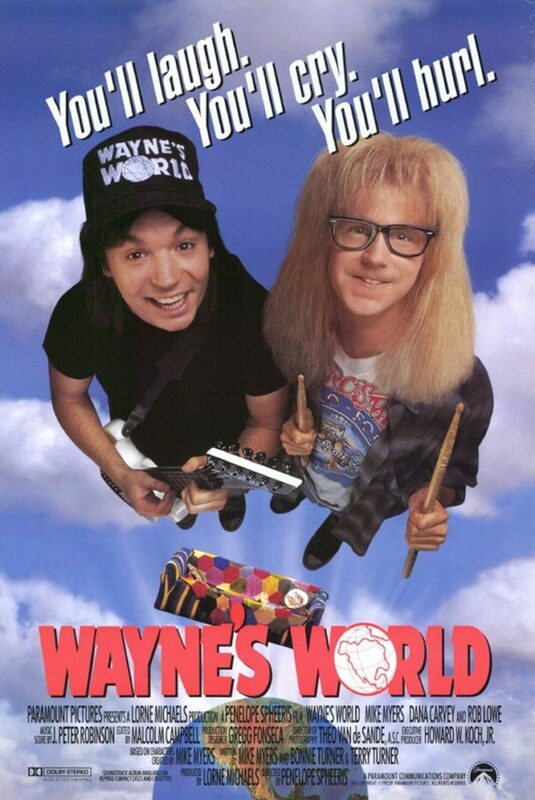 Both were those great fun finds in between Wayne’s World and Wayne’s World 2 when I was a kid. My dad showed me So I Married an Axe Murderer on PPV when I was a kid cause Mike Meyers was in it and after seeing the commercials, I got my uncle to take me to see Clean Slate the weekend it came out and I was visiting him. That movie is a fantastic showcase of how good Dana Carvey is.